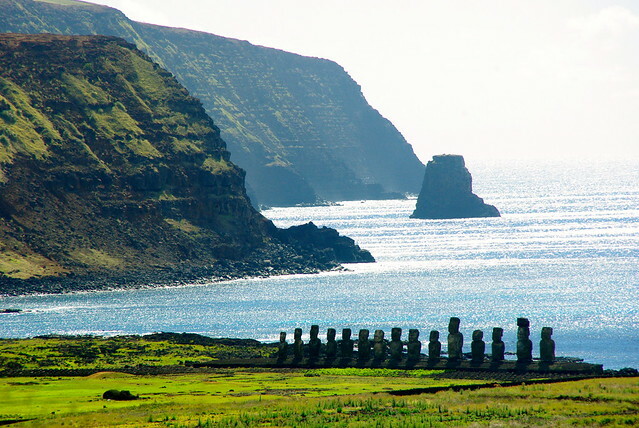 Easter Island is one of the world’s most isolated inhabited islands. It has an area of only 63.2 sq miles with 5,800 population counted for in the 2012 census. This is not a big island so you have to wonder what you are supposed to do all day once you make the 5.5 hour trip into the middle of the ocean. Upon landing I instantly had flashes to Gilligan’s Island, and felt a bit of unease at being so far away from civilization. As cool and exciting as it was to be out in the middle of nowhere…we had a sudden realization that we are in the middle of nowhere! I was racking my brain to try to remember how Gilligan’s Island ended and if they ever ended up getting off the island? 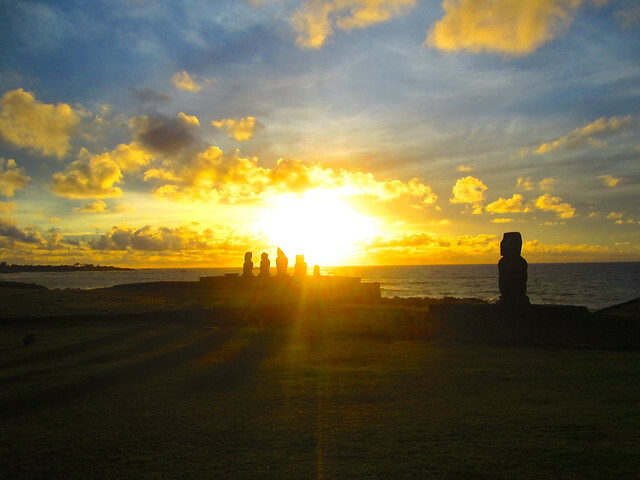 5:00 AM After a good night’s sleep at Hotel Manavai, my fears subsided and we were up early to drive across the island to watch the sunrise over the moai at Tongariki. We rented what we assumed was the crappiest car on the island. Next time, I will take our hotel owner’s, Benjamin, offer to help us rent a car, I am sure what he would have provided would have actually had locks on the car doors. Since the island is so small, when people saw us drive past, they probably recognized the car and knew we got suckered into renting it! 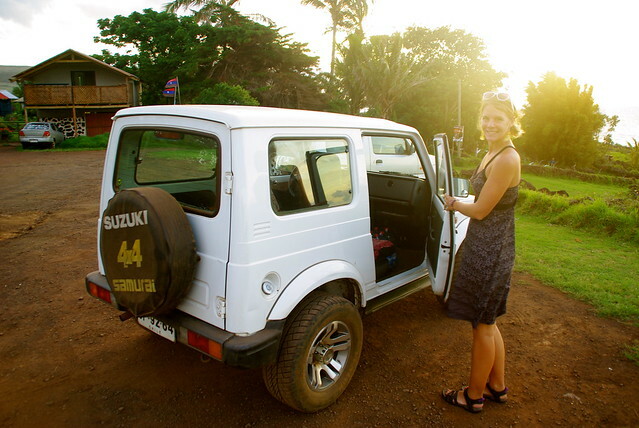 We were thankful when the engine started at 5:30 AM and we began our rickety drive across the island. It was dark. That seems like an obvious statement since the sun had yet to rise, but with no street lamps or store lights it was just us and nature for the first hour. We brought our head lamps and flashlights so we could see the map and ground as we walked around. 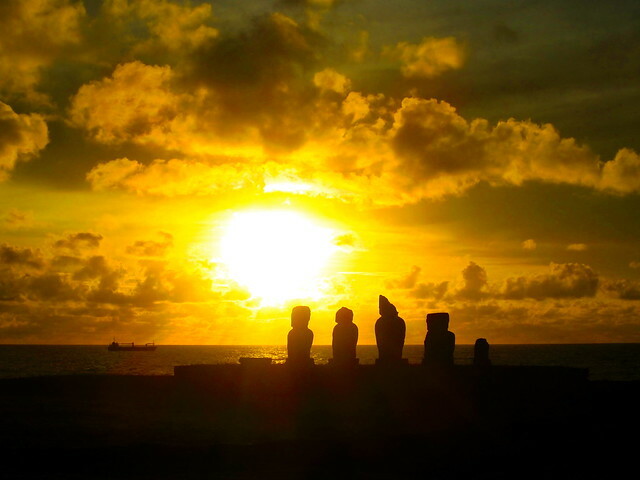 We were the second car to arrive at Tongariki and got out early to stake out a good spot in front of the Moai. We watched as more cars arrived, and more and more tourists lined up in front of the Moai. Photographers set up their tripods and adjusted settings in order to capture their perfect photo. 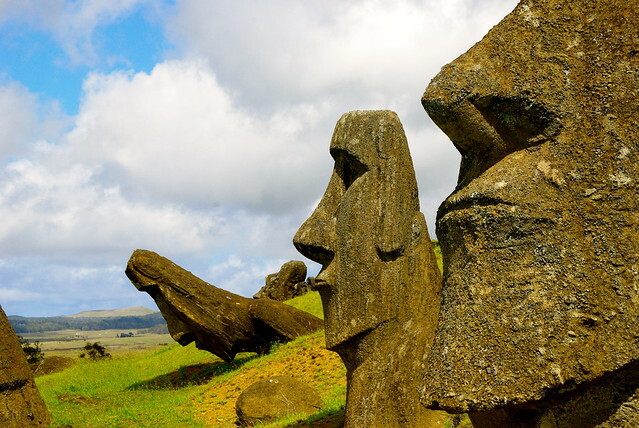 A group of girls had decided that an entire bag of Lay’s potato chips would be a good breakfast to enjoy in front of the moai, the loud crinkling bag definitely ruined the peaceful atmosphere. Sun rays began to slowly peek out from behind the statues. 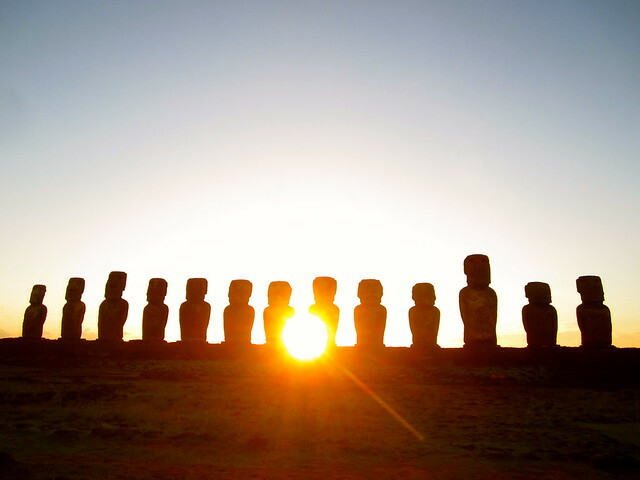 It felt like we stood there taking the same picture over and over, but after reviewing them we can see that the sun shone brighter and brighter from behind the Moai. 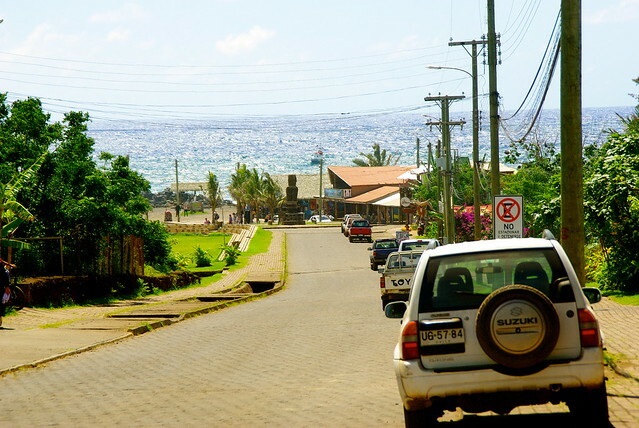 Tongariki is one of the most stunning sites, situated on the coast between Ranu Rakuru and ocean. 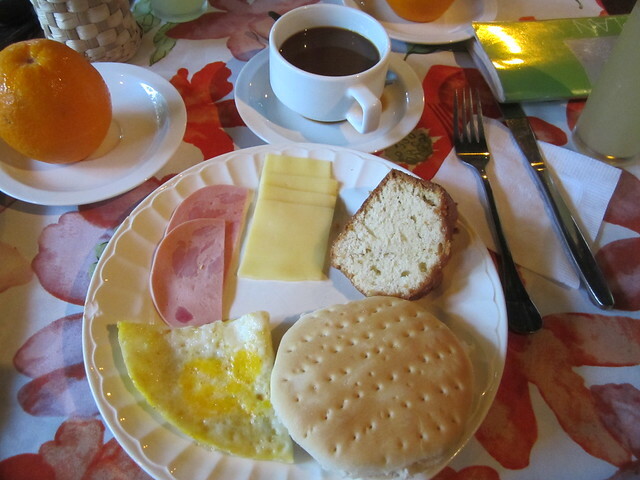 8:00 AM – After enjoying the sunrise, we did what any normal, hungry couple would do. We drove the hour back to Hotel Manavai for their deliciously filling breakfast. The island was small, and we weren’t willing to pass on breakfast just because we were on the other side of the island. 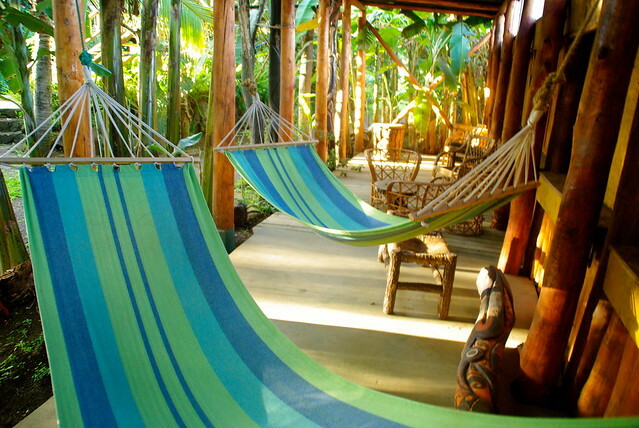 We have realized how much we love “breakfast included” when it comes to booking a hotel. Knowing you are able to wake up and have coffee and food (whatever it may be) prepared and waiting for you is our favorite way to wake up. 10:00 AM – Stuffed and ready for the day we head out for the second time to explore the rest of the moai. 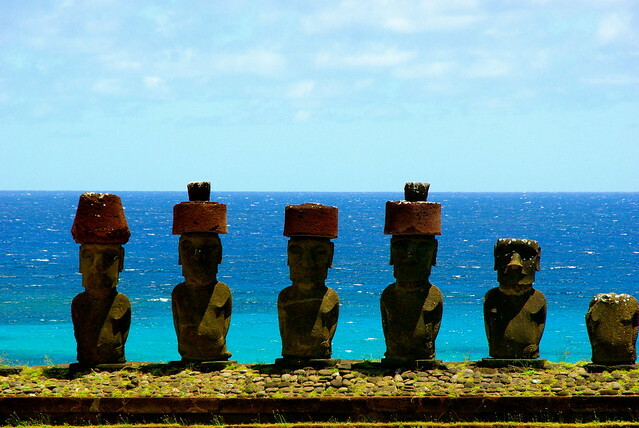 We opted to spend our time on Easter Island without a guide. I won’t bore you with the pros and cons of having someone drive you around all day, but we decided to go it alone and were glad to move at our own pace. 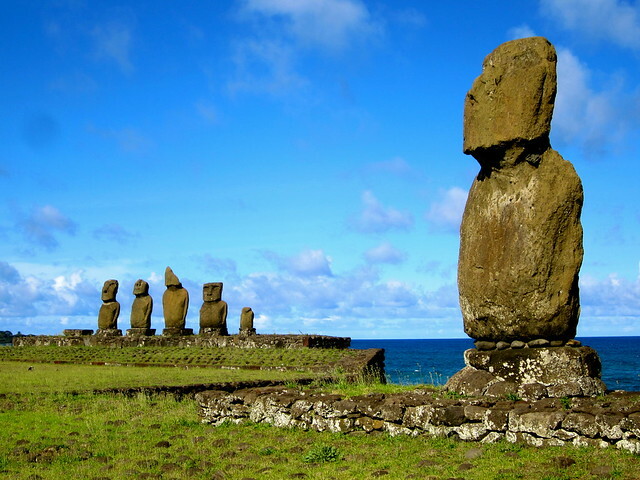 We will go into more detail in our Guide to Easter Island about how to get around the island, for now just wanderlust over some of our photos! 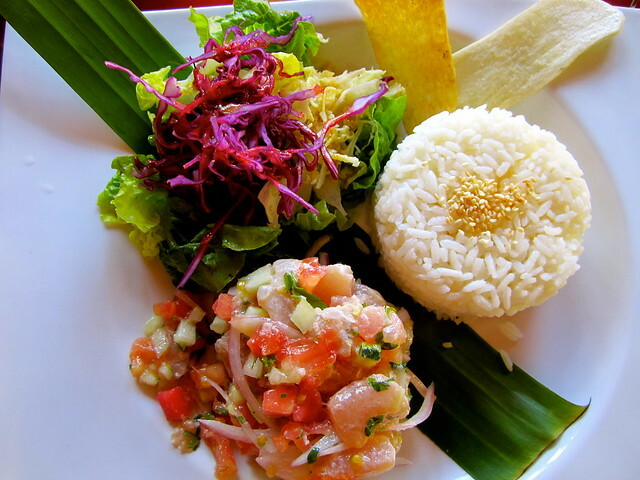 4:00 PM – Hungry and tired we refuel on ceviche at Te Moana in Hanga Roa, which we would highly recommend. It was unbelievably delicious, and if you go during lunch when they have a special menu, it’s much more affordable than the dinner prices. 5:00 PM We are full. Stuffed with fish, rice and salad, but our bodies can’t stop. 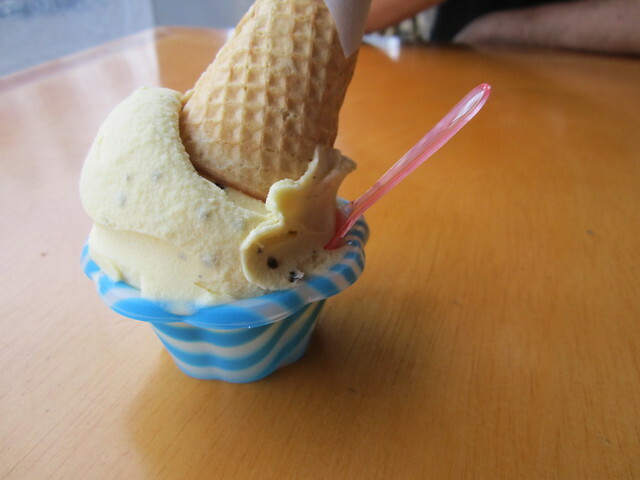 We are at the mercy of our sweet tooth and our bodies walk us to the best helado shop I have (maybe) ever had. Every day they have new flavors and every day we get a simple, single scoop of the most flavorful ice cream I have eaten this year. They don’t do boring flavors here, you get to pick from kiwi, maracuya, pistachio, guava, coconut, etc. Luckily I am a blogger and you can’t see me drooling right now. I won’t go any further, let’s just agree that it was delicious. 5:30 PM – We had three hours left before sunset. 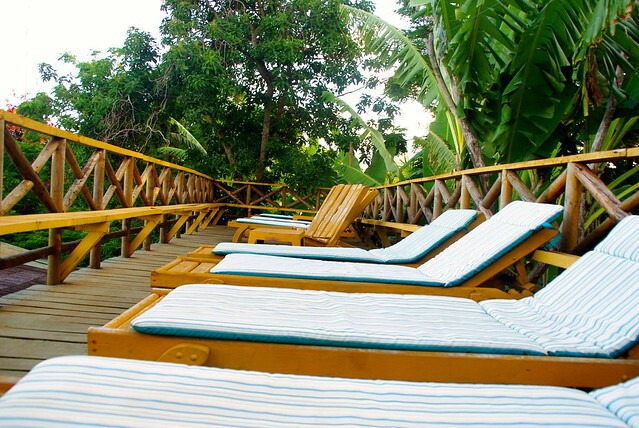 We were statued-out for the day so we decided to spend the last few hours relaxing by Manavai’s pool. 8:30 PM – The sun sets late during this time of year. We walk over to Tahai, only a 15 minute walk from Hanga Roa, to find a good spot to sit among the crowd and get our sunset photos. 9:30 PM Back to Hotel Manavai to settle in for the night after an exciting day. We still can’t believe we were here! 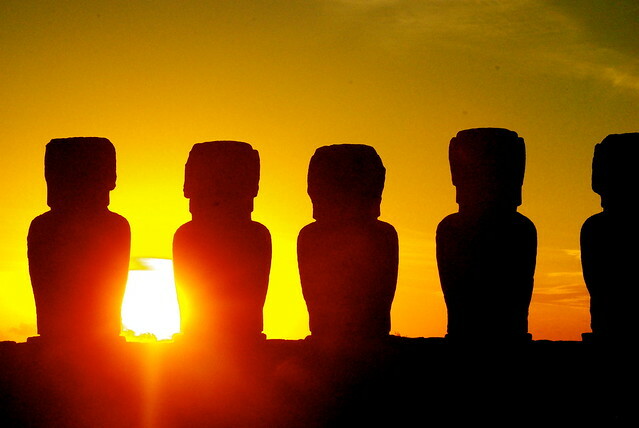 Easter Island was a dream that we are still trying to figure out if it was real. For 4 days we walked around in disbelief of the intriguing moai and just the feeling of being on an island so far away from anywhere. 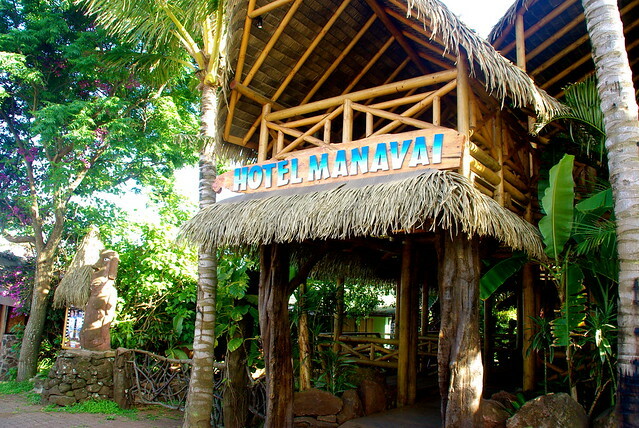 Thanks to Hotel Manavai for sponsoring our stay on Easter Island. Those pictures make this post awesome. Congrats on the choice. 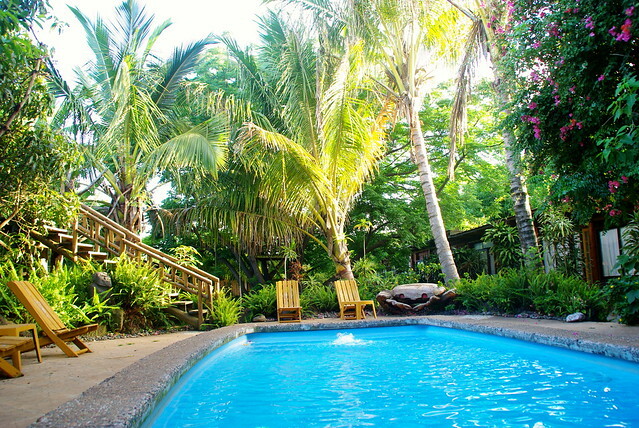 Great island.